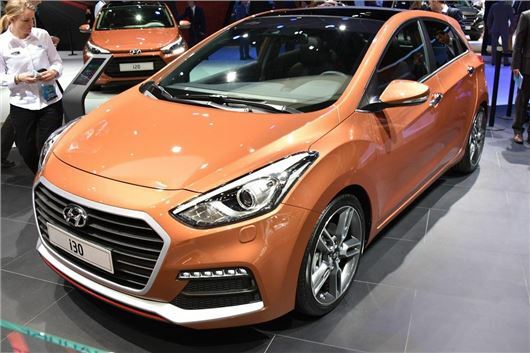 Hyundai has shown off the revised i30 at the Geneva Motor Show. It appears in showrooms later in March, priced from £15,195. The revised car gets minor styling tweaks, a new transmission option and improved economy, plus a new top-of-the-range Turbo model (pictured) with 186PS. This high-performance version is powered by a 1.6-litre petrol engine which, as the name implies, is turbocharged. 0-62mph takes eight seconds and there are various Turbo-specific styling details and badges. It’s priced from £22,495 for the three door, while the five-door costs £22,995. Another big change is the additition of a seven-speed dual clutch automatic in place of the old, traditional six-speed transmission. The new gearbox is offered with the 110PS and 136PS 1.6-litre CRDi diesel engines. It brings emissions down to as low as 109gkm. The cleanest engine overall is the 1.6-litre CRDi diesel with Blue Drive, which emits 94g/km of CO2 and has official economy of 79.6mpg. Buyers can also get a 1.4-litre, 100PS petrol with official economy of 50.4mpg. The entry-level model is now called S instead of Classic. It gets keyless entry, USB and AUX connectivity, Bluetooth and air con. SE trim adds alloy wheels, cruise control and parking sensors. SE Nav adds navigation and a reversing camera. Premium models benefit from HID headlights, heated leather seats, heated steering wheel, dual-zone climate control and a smart key with engine start button.